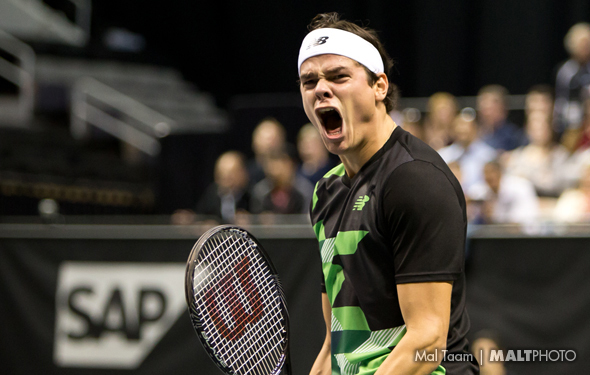 FROM THE AUSTRALIAN OPEN, January 21 — Canadian Milos Raonic has been so steady and lethal over the past nine days. He is powerful, he won’t go too early to try and kiss the lines, and he thinks a lot. He was been injured so many time over the past two years, but today, he was smart and focused. Raonic saw it, but he didn’t want to think about it for a long time. He needs to continue to focus. “I think it can have an effect. It’s like if a top guy after winning a game, even though they are behind against a player that maybe hasn’t been in a scenario is a bit more vocal, tries to sort of amp themselves up,” he said. Raonic reached the Wimbledon final a couple years ago, and after that, injuries slowed him down. It has been a tough patch to deal with him. However, when he is healthy, he looks very good. The big man can shorten the angles. Will he survive the rest of this week? Nobody know, but he is trying. “If I can do my things well, if I can go away and train, I don’t necessarily always need to hit that much with other players. If I can do my specific things well, if I can serve well, if I can be efficient, coming forward and first chance I get, and I can recognize those moments, I can always put different pressure. And I think all those kind of things and just the process I go about and how I like to keep to myself when I have been away. He will face the Frenchman Lucas Pouille, who has risen again. That should be some fascinating rallies. If you watched it on Sunday night, Stefanos Tsitsipas overcame the great Roger Federer in four classic sets. Tsitsipas stood tall, while Federer missed some key forehands and watched 12 break opportunities float away. That’s what happens, when you cannot play perfectly. Tsitsipas almost did it. Karolina Pliskova smoked Garbine Muguruza in two sets. I mean she knew exactly how to play against her. And she did, with incredible confidence. So now the Czech will have to face Serena Williams, who overcame the No. 1 Simona Halep 6-1, 4-6, 6-4. Pliskova reached the 2017 US Open final, losing in a close three-setter to Angie Kerber. She has been around for a fair amount of time, so at some point, she will have an opportunity to go super deep. But, she has to get over Serena, which is very difficult. However, she will have a decent chance. “We played [at the 2018] US Open. I didn’t play well that match, so for sure would be good revenge to play [Serena] again,” Pliskova said. “Different conditions here. I think I’m playing a little bit better than I was last year, so looking forward. I think she’s playing very solid this tournament. … I have my game, so of course I have to take care a little bit of them, too. But I have to play my game so I don’t have any plan B, C, D,” she said with a smile. Last year, outside of college, very few fans knew who Danielle Collins was. Not anymore. The 25-year-old crushed the two-time Grand Slam champion Angie Kerber 6-0, 6-2. Earlier, she took down Julia Goerges and Caroline Garcia. Those are three top-10 players. Over the years, it is very rare for the college players to go on to the tour and eventually crack the top 10. Or eventually make the top 20. Right now, though, Collins has already reached the top 25 and if she keeps playing this way, she can go way up high. She will face Anastasia Pavlyuchenkova, who stunned Sloane Stephens, very late at night. … A tougher match for Ash Barty, who played a great contest, beating Maria Sharapova, but she has to play Petra Kvitova, who is on fire.